Last week was my Summer of Hell week. Every summer, there is that one week that you feel like you are about to wilt, then swell up, then die from the heat. I am giving eternal praise for the guy that invented the Air Conditioner. I grew up without AC in the house. My parents had a window unit in their bedroom, and we would camp out in there at night when it was unbearable. Besides being uncomfortable and sweaty, I feel just plain miserable in the humid heat. I would rather live inside a snowman in my underwear for the entire winter than go one day without the AC in the high humid hell hot weather in the summer. The Hell week began on the Friday before last, then lasted through the weekend-which was fine because we have air- building up steam and humidity and getting hotter and hotter, and then Mon-Thursday was the equivalent of 105F all week. I was "working" at my Aunt's all week, just making sure my Uncle stays safe. He has no fat so he doesn't feel the heat like I do. I get super bitchy when I'm hot and their house was not even COOL...in the room my Uncle stays in it was still 80-85 f'ing degrees. I had to retreat to the middle of the house, so I could get relief and not die in a melted fat puddle on their couch. That's the only thing I hate about my "job" is when it gets unbearably hot. So Friday is here now, and I'm in a great mood at the end of the day. The clouds are super dark, and there is that energy in the air that happens when a big fat storm is about to go off! I come home from "work", get settled in, plug in my laptop and finish subscribing to a bunch of sewing blogs I found where women my age make awesome vintage clothes to put in their wardrobe. So I'm excited to look through all the wondrous blogs and websites of the creations I found during the day. I pop open a fresh Coke, and I'm getting down to business. Dr. Phil comes on at 5, and distracts me while I'm checking tons of email. So it starts to storm super bad, and I'm grinning like the Cheshire cat, because I'm finally going to start cooling off!! The sky explodes and dumps tons of rainwater all at once. There are a few loud close booms of thunder. The wind is blowing super hard and I'm doing this stupid lame version of the happy dance by moving my neck and shoulders like Walk like an Egyptian to no music, and to express to nobody else just exactly how excited I am about a thunderstorm. Then the worst possible thing happened. The power goes out, and does not flicker nor comes back on...until Saturday at 9 pm. That means no internet, no TV, no lights, no sewing machine, and no phones. Our landline was switched to Comcast and now we don't have a phone during a power outage. Seriously, WTF. And that storm that was supposed to drop the temperatures super low? Hasn't really happened until Monday evening. Saturday was a solid 85F starting at 10am and lasting all day long. I got a lot of sleep this past weekend because there was literally almost nothing to do without sweating. Did I mention that the air doesn't work in my car? Well, it doesn't and my car smelled like burning plastic on the way home from work last week until I was able to park it in the garage. Luckily my iphone was fully charged when the power went out, and (lucky again) I had already asked for a bunch of lives from people, so that kept me busy on Friday night. Saturday morning, I got the idea to charge my phone in the car. I borrowed my Mom's charger because I couldn't charge it in her car unless it was running. Wth....I love new technology, but let's not get rid of common sense. Just because it's cool to push a button to start the car, then make a double click so the power runs without the engine on. duh. So since I have a car from the last millenium (ok, it's a '99) of course it will charge in my car without running the engine and causing the family to die in the garage from carbon monoxide poisoning. So being nice, I charge my mother's phone first. Then I charge mine up until 29%. Then I run the battery dead. *I'm still parked in the double car garage with a pool table between the cars and not possible to jump start from that position. So now I have no TV, no phones at all, no internet and no sewing machines, no Air or adequate lighting. This makes me sad and frustrated and mad as hell, because I had big plans to be living it up in the AC all weekend after the Week of Hell. I'm so disappointed that I start to read in bed, in a dark room to keep out the heat, with a flashlight, and I picked one of those old cheap novels that have tiny type print. Trying to read in the half-dark/too-bright LED crappy flashlight is starting to really strain my eyes. And the air is still humid and I'm laying still so I don't expend any energy so I don't accidently burn a calorie and start to overheat. I end up falling asleep at 2 pm and stay like that for most of the day. Then the power came on at 9pm on Saturday, and I was alone on the house, and I cranked the AC to super-freezing for a few hours, turned on Bio and watched Celebrity Ghost Stories, and it made the day a lot better. For some reason, not having power took a lot out of me and I fell back to sleep for the night around midnight. LAME weekend. And then I received almost 385 emails that I had to wade through and read (some are still book marked) and it took until today to get through. How was YOUR weekend?! I bet it was 300x better than mine! This is Jacqueline. "She" is named after Jacqueline Kennedy Onassis. "She" has lived with us since last fall. About a month ago, my daughter realized that she was really a HE. So meet Jack! He has gotten super big over the last few months. I was asked to check out an online store and give my honest opinion on what I think. The online store is called hip hop 50's shop, as this post is cleverly titled the same! I have been in love with vintage dresses for almost 2 years, ever since I found another online store that sells vintage clothing. I eventually want to learn how to sew all of my vintage dress clothing to wear! I was super excited to know that I would be checking out vintage dresses. 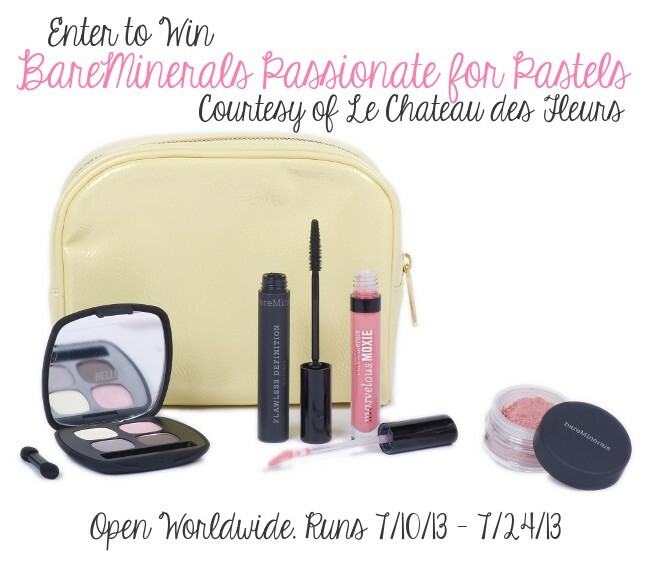 As soon as I arrive to the site, I am smitten with the pink rosy background! This store is awesome. It sells 50s poodle skirt costumes for kids AND adults that are actually cute with all the cute accessories like saddle shoes and cateye glasses! Not the cheap-o ugly costume in a vinyl bag and smells like old band aids that you get at your local Halloween store outlet that is a party store the other eleven months of the year. While the poodle skirts/costumes are cute, it's not exactly what I'm looking for. I click on Vintage Dresses and immediately fall in love with my options! What's really awesome, is that all the dresses are somewhat cheaper than the other vintage dresses I have found on the internet and Amazon. 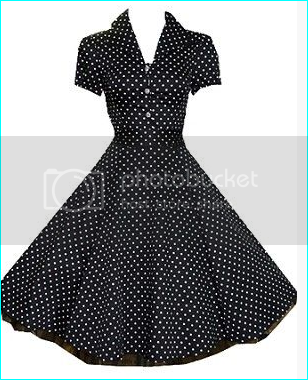 If I were buying the dress today, I would get is the 50s Vintage Tea Dress Black with white polka dots! I love this dress! There is also a red version with black dots! I prefer the black over the red because I could wear this ANYwhere. 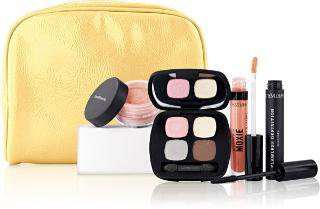 It's perfect for work, to go shopping in, or even to wear on a date night out. I love that it has a full skirt to twirl in. 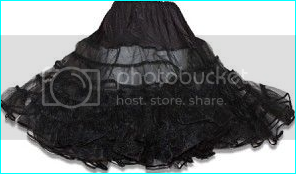 The shop also sells crinoline petticoats to wear under the dress to get the bigger full skirt look that I love so much. I would have to get a black one to go under my dress! I've been checking out petticoats for a loooong time, and have some of the cheaper prices I have seen around. I like the style of dress because it accentuates the small of your waist then flares out, hiding my problem areas-stomach/hips/thighs. I also love the V-neck with the cap sleeves. (I feel like) I'm the only person in the world who doesn't wear tank tops or spaghetti straps because I'm really self conscious of my arms. I have gained weight in my 30s that I'm not comfortable with, so this dress would "hide" the areas that I have issues with. I can't stand being in clothes that aren't comfortable. Overall, this store looks awesome. Not only do they sell 50s costumes and accessories, but they have a selection of super cute vintage dresses. I have bookmarked this shop for the future so I can go back and get the dress and petticoat! Who knows? 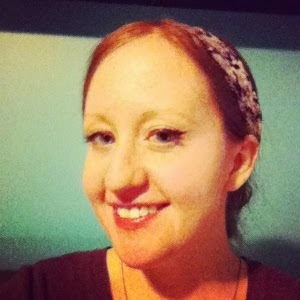 Maybe I'll end up with some matching black cateye glasses and a cute teal chiffon scarf! So lately I've spent some time thinking about my blog and what direction I want to take it in. These are the things I do/I know. 2. Most of the blogs I follow are women from age 20 and up. They blog about one or more of the above criteria. 3. I hate my blog design. Especially since I eff'ed it up and erased the blue zig-zags (...ok...chevron) and getting pissed that I can't figure out how to put it back because it's a premade template. I have actually won a few blog design make overs, but I seriously have SO many things I want, that I'm embarrassed to tell them, so I haven't used my prize..?yet. *EDIT: I just actually looked at the blog, and it's much worse. The white background has turned into a repeating black image with words and a yellow frog. 4. I fear I'm not interesting enough. I'm in a weird funk in my life where I'm not working, but helping my aunt "watch" my uncle. He's basically fine but gets weak when he goes outside for too long, and has a super low blood pressure. This is the longest time that he has stayed well, and hasn't had a major setback. I have a teenaged daughter, and she's definitely not doing cute things that make me laugh about. She is actually an awesome kid, but I don't feel drawn to the Mommy BLogger Groups. The people I hang out with are considered more like acquaintances than real friends. I actually prefer to stay home and do my own thing, than hang out people that I don't really love to be with. I don't have any RL friends that share my love of fabric and sewing-which I am working on to change. The last guy I dated was over a year ago. But this is a blessing because I haven't been alone for an entire year for over 10 years. I'm not upset about that at all. I don't have a lot of money right now. I can't afford to buy new outfits to sport on my blog. Besides, who would take the pictures?! Because I don't have a lot of money to spend on extras, I don't have a ton of money to spend on designer fabric to make all the quilts and dresses that I really want to have. *Note: I realize I can get a job, but family is really important to me, and my aunt has helped me out my whole life without asking anything in return, so I want her to feel comfortable leaving my uncle at home by himself, before I look for a job* Basically I watch a ton of TV and am scouring the internet in obscene amount of hours per week. I'm not sure. I guess I'll just keep doing what I do, and be a hodgepodge sort of blog. I love sharing my love of stuff with others, so that's what I'll keep doing. I know it's not about the numbers, and I don't care about those. I would like to find some readers that like to read it and talk to me. I'm the shy girl that is really quiet until you get to know me. I prefer quality over quantity any day. But I also like some compared to none. When I was asked to check out this app and give my opinion, I knew exactly who Little Critter was. Just to make sure I wasn't imagining reading Little Critter books when I was really young, I googled to see how old Little Critter is, or to be more specific, how long he has been around. Little Critter first appeared in 1975 which makes him 4 years older than me, so I definitely remember him! The App is called "The Trip-Little Critter Reading Adventure" by Mercer Mayer. It's available for iPhones, Android, Nook and Kindle and costs 99 cents. 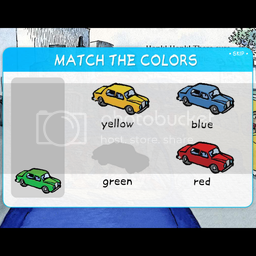 This app is for preschool and early elementary kids, ages 3 to 7. There are two ways to play this app. The first is the Just Read function that reads the story aloud for your child, and the more exciting Reading Adventure, which also reads the story for your child, but is filled with lots of different and fun game interactions along the way. 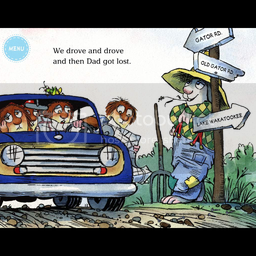 The storyline is about what happens with Little Critter's family goes on a trip. The Reading Adventure starts by running through a quick tutorial of the functions you will use in the game. It's very simple to learn, and access these functions by clicking the Menu button on the top left side of the screen. Little Critter has a backpack where you will collect a few items that you will need along the trip. He also has his map, where you are asked to choose the next destiny. The last function is Flashcards, and this is one of the fun mini games in the game. Along each point on the map, you can press on different objects and try to collect 26 cards based on each letter of the alphabet. Sometimes you may find something for your backpack, and sometimes you might get a flashcard. Besides picking up objects, the game is interactive by pressing on the different characters in every scene. At first I was pressing everything just to make sure I didn't miss something. About half-way through the game, I noticed anything you could interact with has a small (sometimes flashing) dot on the character or object that is interactive. 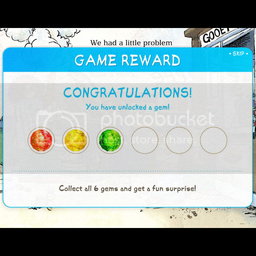 Plus there are 6 mini games that you play based on spelling, counting, and colors that you can collect a gem when completed, that will give you a fun surprise if you collect all 6! Overall, I really enjoyed this app. I completed all the mini games in just over an hour or so. I can see this lasting much longer for a little one because of the mini games. I would have loved this game as a kid, and it would have kept me busy for a long time. For a smaller child that is just learning, an adult is probably needed to help assist with the game for a bit, especially with the mini games, which makes the Just Read function nice when Mom is busy. The only tip I have is to be aware of the tiny blue dots. I was just looking at the Help screenshot I provided above, and there are 3 different colored dots that mean different things. The blue dot is for animation interaction, the orange dot is a flashcard card, and green dots are items for your backpack. I honestly did not notice the difference last night, but I was playing in the dark. After a double check, the flashing dots ARE different colors. As I said, I didn't notice the dots at first, so maybe if you have an older kid that doesn't read the Help menu (like my kid), it might be more challenging if you did not mention the dots! I would definitely recommend this game for your little ones that love Little Critter. It's fun, but educational at the same time, which is important when choosing good apps for your children. At the end of the game, it will give you the option to purchase an additional gamepak. You can read more about Little Critter and this app: here. Does this happen to anyone else's family too? !